Many thanks Bob, that was very helpful! The going over to white was that perhaps a start on the movement to more simple frugal architecture and decoration as opposed to the heavy Victorian style? And that it came earlier in the West could it be that these movements was stronger there? Wild guessing from my side. 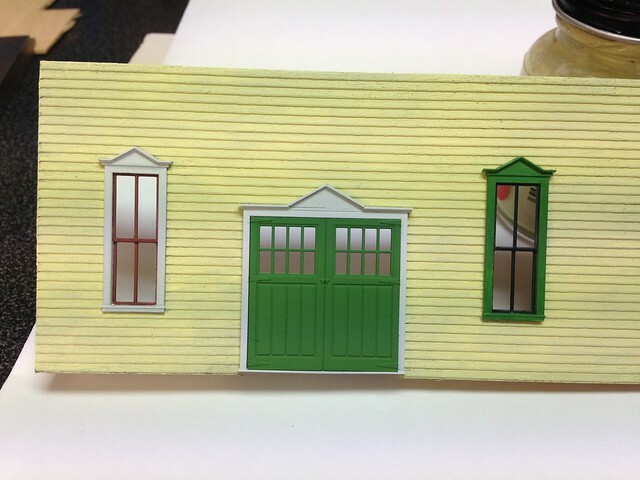 I tested and painted up two windows one with sashes in boxcar red and one with green frame and black sashes. I must say that I was a bit skeptical to the green and black but it looks quite good. Both windows looks good though. Back for a 2nd look. The right side looks sooo Victorian. Think complimentary colors (??)... Now where is that color wheel? White/red gets my vote... or a much less saturated green (mixed with a naples yellow red or flesh color). The black sashes will more or less dissappear when the building is closed and the interior is dark. On the green I agree with Troels as it is a little to much. I'll try mixing it with some naples yellow red. White / red would be my choice.. I'm glad I'm being helpful. Why Styles come and go (and then come back)is anybodies wild guess. All we can really do is try and observe what happened. From what I have read Victorian fashion was a backlash to Puritan values of all white, simple pragmatic usefulness and modesty. I believe that Victorian styles where moderated because the love of money started to become grater than the love to show off (by processing beautiful things). In manufactured goods, this can be seen in everything from product boxes to locomotives. To use a non-railroad example. Look at the basic all purpose wagons. They went from blue and green bodies with red wheels in the 60's to all black by 1910. In the 70's their stripping was not surpassed by the stripping we find on Steam locomotives. Even standard, non exciting Grain milling equipment like a grain hopper would often have pen stripping. But in the next decade that was decried as a waste of good money that could of been spent on grain! Interesting reading but let the historians do it. You spend your time modeling and trust the observations of those who have spent too much time in research like me. If it was my frt. door I would paint the interior panels the cat whisker color, the trim green (with a little Naples Yellow added) and Mullins black or red. Hi Martin and Bob, I went for the white/red option this time. 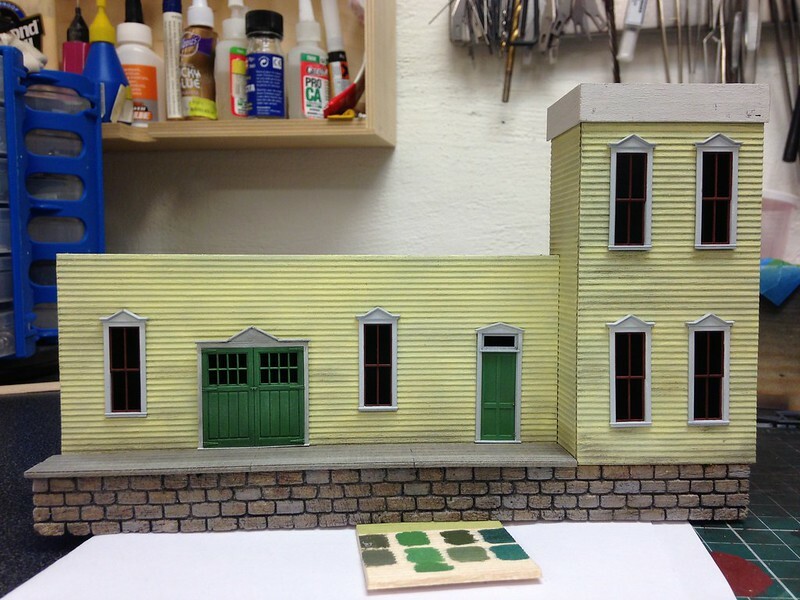 More of laziness as I had already painted the doors green at the beginning then by actual choice. The green/black or green/red is reserved for the next project! Here is a picture of the progress so far. I have glued a black cardboard at the back to stop one seeing the backdrop and for adding stability. There are also lots of bracing. I tried to weather the siding a little by using a steel brush taking away a little of the paint. 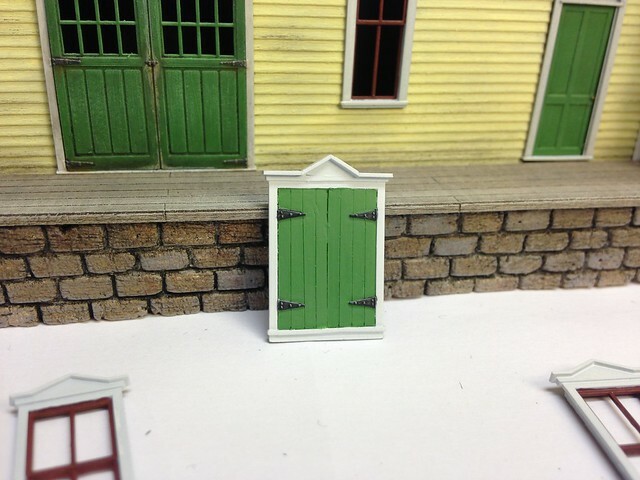 Also the doors have been painted/drybrushed over with the green mixed with naples yellow red and drybrushed again with lighter green of the same mix to pop out the detail. The hinges will be painted another color though. The foundation did not come out as I wanted. I tried to close the plaster a little by spraying on some matt varnish but sprayed on to much so sealed it completely. The treatment afterwards with the paint in a sponge did not behave I as I excepted and the surface came out looking very painted. I really like the subtle weathering along the base of the structure and that foundation turned out OK in my book. H�kan, try applying pastels/chalks to the stones. Dab on some colors randomly, and then work them in with a soft paintbrush. That'll help break up the 'even painted' look. Although I think the stones don't look that bad. The foundation is fine. Maybe dry brush a stone here and there a little difference earth tone but nothing drastic. I sometimes use a brass brush to tone down color on a surface, and make it a bit less regular. It will often leave a little brownish yellow color behind, though. Many thanks guys, today the foundation looks a little better, but I'll try some of the techniques you suggested. We have been busy packing as we are leaving for a one week vacation so there has not been a lot of time for modeling. It will be great going away but where we are going (Austria) we don't have any good Internet so I can't even go and look at the forum. We are going to ride some cog steam trains so hopefully I can show a picture or two when I come back. on the door trying to simulate areas where the paint has been abraded down to raw wood. 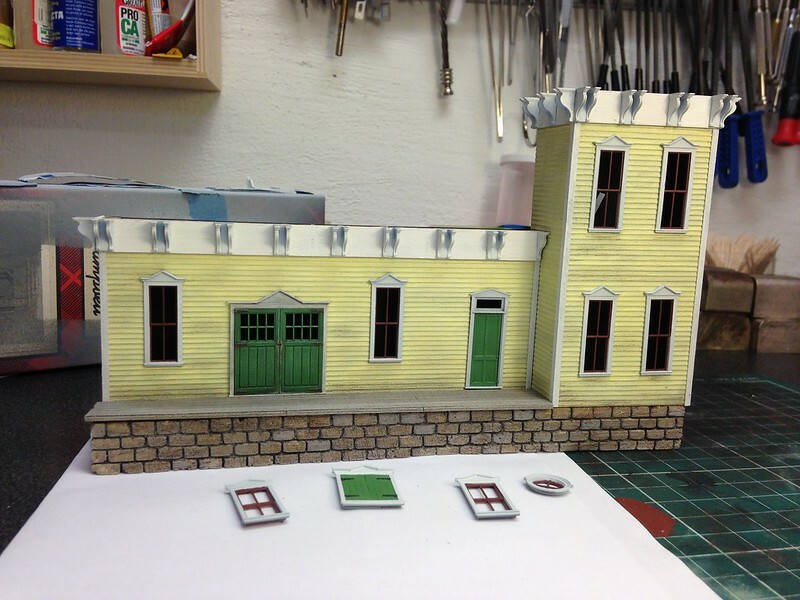 Next when I come back is to start on the roof and continue with the weathering. See you again in a week! Very nice H�kan ! I too like the red/white. mix a batch of the red, adding a little white to it, to lighten it a bit. Stipple some of this lighter shade onto the red of the windows.